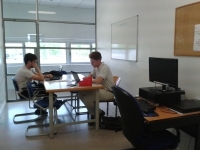 The rooms must be used for collective activities of study or research. To use the workgroup rooms you must be member of the UA University community and make the corresponding reservation. The booking holders themselves must deliver and collect the University Card (TIU) at the information desk. Access this tutorial to help you make the reservation. Monday to Friday from 9:00 a.m. to 9:00 p.m. It will be closed on the weekends, holidays and holiday periods. Its use must be related to collective activities of study or research. A delay of more than 15 minutes will cause the loss of the reservation. In the Arts Library if the room is booked for two hours, the non-appearance during the first half hour will result in the loss of rights reserve. If the room is booked for three hours, the non-appearance during the first half hour will result in the loss of rights reserve. The booking holders themselves are responsible of the room. If they detect any damage in the room (before occupying it) they must communicate it at the information desk. This service is subject to the general library patterns of behaviour: no smoking, no eating, no drinking, to respect furniture and computer equipment. The misuse of this service will involve the suspension of the right to use the library services. Even if the user is outside the room at some point, he will remain responsible for the belongings he has left on it. The Library staff will not guard any object owned by a user.